The collect (stress on first syllable: KOL-ekt) is a traditional, formal short prayer of Western Christianity. The Latin missal simply calls it oratio (‘prayer’). However, the Gregorian Sacramentary has oratio ad collectam, and then, in two places, simply collecta. In the earlier Gallican use, the term is first collectio, before becoming collecta. The term remained in popular use among churchgoers while missals chose oratio. Perhaps it is no surprise that the Book of Common Prayer chose the popular vernacular name ‘collect’, but more surprising that the new translation of the Catholic missal has opted for ‘collect’ where its predecessor had a prosaic ‘opening prayer‘. The collects of the Church of England and the Catholic Church preserve many old Latin models. The major division of the collect is between clauses 1–2 and 3–4, often marked with a semicolon. In collects for saints, the second clause says something about the saint in question rather than describing a divine attribute. Rather wonderfully, this shows the holy life as a glimpse of divine revelation. Most collects address God the Father, and so the doxology (which is often not written out in full) declares that our prayer is made through (per) Christ (or ‘the same’ Christ if he is mentioned in the body of the collect), and may add the unity of the Holy Spirit too. Some have remarked that the quality of the collect is frame for our petitionary prayer which should flow from an understanding of God’s nature. It is a snapshot of how lex orandi models lex credendi, or, put another way, how doctrine should feed into our spiritual life. At the eucharist, the praying of the collect concludes the gathering rite, the first part of the liturgy, and thus herald the Bible readings. The placing of collects for Sundays and holy days together with the epistles and gospels in the Book of Common Prayer (which makes sense, because one reads the collect, epistle and gospel in order) has led to some Anglicans, particularly evangelicals, to desire collects that reflect the readings or themes of the day. I think this is wrong, seeing as the collects are designed succinctly to draw divine qualities into our daily lives, and so belong to our gathering and preparation rather than an introduction to the readings. The gathering rite at its simplest (and ’tis a joy to be simple) has just a liturgical greeting (The Lord be with you) and a collect, although prayers of penitence usually occur between the two. The Catholic Church developed a series of other collect-like presidential prayers: the prayer over the gifts and the post-communion prayer. Common Worship has fully embraced post-communion prayers, gathering them with the collects proper, and it suggests some ‘prayers at the preparation of the table’ that cover some elements of the traditional offertory prayers. In daily prayer, the collect comes at the end of the intercession. In the Book of Common Prayer, three collects (or four during Advent and Lent) follow the preces toward the formal conclusion of matins and evensong. Common Worship has followed the modern practice of retaining just one collect where a series of such had previously been used. However, its structural framework means that an unchanging ‘opening prayer’ is also used. Likewise the Spirit helps us in our weakness; for we do not know how to pray as we ought, but that very Spirit intercedes with sighs too deep for words. And God, who searches the heart, knows what is the mind of the Spirit, because the Spirit intercedes for the saints according to the will of God. If the bidding can convey the merest sense of those verses, then the silence just works. The bidding then is not an introduction to the collect, but to the silence. The collect then is a voicing of an aspect of the heartfelt silent prayer. A good trigger that works for me is a simple bidding like ‘Let us pray deeply’ or ‘From the depths of our hearts, let us pray’. Words alone are not enough; as a priest I need to model this deep prayer. I must not be looking at the book or looking around, but I must pray with bowed head. Whether the silence is ten or twenty seconds, or more, does not matter, as quantity of silence is replaced by quality. In a church full of people who want to be led in prayer, this works well. However, at weddings, funerals and baptisms, among those who may not be regular churchgoers, and who may not be focused mainly on spiritual things, the collect becomes transformative. There is a witty saying when people see me in a cassock — ‘Say one for me’ — and this is ‘Say one with me: it’s deep within you, and you want to pray’. The celebrant faces the people squarely during all this in modern rites. Hands are folded for the bidding and silence. The arms are raised to the orans position for praying the collect. At the doxology, the hands are folded once more. The orans position is somewhat Y-shaped. The hands are raised upward, but no higher than the shoulder. 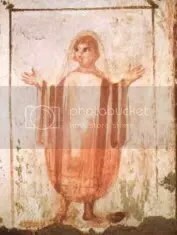 The expansion of the gesture should be determined by whatever looks natural (not too tight and Tridentine, not too large and theatrical) and the space (it can be larger at a high altar, smaller in a cozy chapel). Categories: liturgy | Tags: Anglicanism, Book of Common Prayer, Catholic Church, Christ, Christianity, collect, collecta, Common Worship, flectamus genua, God, Holy Spirit, let us pray, levate, lex credendi, lex orandi, Lex orandi lex credendi, liturgy, Missal, orans, oremus, prayer, Religion and Spirituality, Roman | Permalink. A priest of the Church of England, who is Chaplain of Hertford College, Oxford, and doing Syriac research at Oxford University. A very helpful overview of collects, their purpose and place in liturgy. Thank you for this.